​Zamioculcas and Sansevieria are some of the most resistant indoor plants and they do not need too much care. 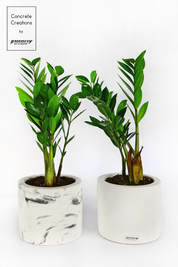 Zamioculcas and Sansevieria need water once a month, depending on the atmospheric humidity. In winter, the watering could be sparser depending of the heat of the room. They can be placed in an illuminated room but they can live in a shady place, too. The direct light can create burns to their leaves. They must be placed in a well aired position. It is important not to get in touch with heated air (air condition, heating radiators, etc.). The fertilization must be done every two months, which is every second watering. A fertilizer for indoor plants could be ideal.